Today I have a secret recipe for a rich and decadent dessert from Mrs. Fields. 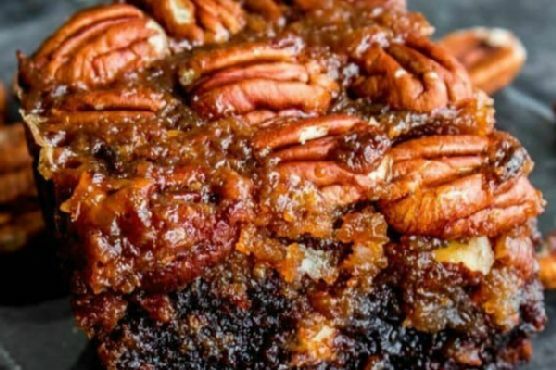 This yummy treat is a combination of pecan pie and fudgy brownies. Everyone is going to love it when you bake these at home. Mix pecan halves with 1 tablespoon of dark Karo syrup and set aside. Beat shortening with brown sugar until creamy. Add molasses, 2 tablespoons dark Karo syrup, and pecan pieces, blend. Beat in egg yolks and vanilla. Measure flour, add baking powder, baking soda, and salt. To batter slowly mix in dry ingredients until all ingredients are blended well. Place in a 8″x 8″ greased baking pan. Top batter with arranged pecan halves that have been mixed with the dark Karo syrup. Something is missing from this recipe.